Hello and welcome to The IDP Guru, your one stop shop for everything IDP related. I have IDP rankings, starts/sits, sleepers, busts, and so much more. I am always available through e-mail, post comments, or the IDP Forum to answer any and all of your questions. My goal is to make this website the most comprehensive and exhaustive fantasy football IDP website on the Internet. I have been up and running since November of 2009 and have received very positive responses so far and continue to work hard each and every day to keep the positive reviews coming. 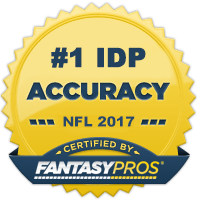 That hard work has paid off in the form of back-to-back #1 "Most Accurate IDP Rankings" awards as judged by FantasyPros (2016 for in-season rankings and 2017 for draft rankings). Just like you need to be fully informed about your IDPs before betting on them, you need to be fully informed about online casinos before parting with your cash. For this reason you may want to take a look at Play Casino Online - a comprehensive source of information about any kind of game by provider, software and country. This site provides a host of strategy guides and explains how to best play each game - and how not to! Whether you bet on football, play online poker or visit online casinos, the choice now exists to bet with dollars or cryptocurrencies such as Bitcoin. Using cryptocurrencies for deposits and withdrawals has advantages inasmuch as transactions are usually instant and free of charges. You can find out more about betting with cryptocurrencies at BitcoinsPoker.com - which although focused on online poker includes a handy explanation of how to buy and sell Bitcoin. If you're looking for the top football defensive expert player news, you've come to the right place! At IDP Guru you can find all the information you need on rankings, defensive guides, and even tackle frequency. Many football fans enjoy betting on their teams. However, if you are also interested in winning real money whilst being strategic, check out www.pokersites.ca as there are plenty of great sites to play on. However the choice can be difficult so, if you are still unsure on what casino or betting game to play here are the options for US players. For now enjoy your time at IDP Guru! I am continually working on improving the design and layout of the website as well as updating and expanding the article selection. I also scour the Internet for as many IDP related articles, resources, tools, etc. as I can find and post them in the sidebar of the site. So essentially, when researching IDPs, you can come to my website and get absolutely everything you need.Make sure and check out the IDP Forum as well. This is a great place to get involved in the IDP community and gain valuable knowledge to dominate your opponents. With the exception the draft guide, I do not charge anything for any of my articles, advice, etc. However, I do have a donate button if you want to throw some change my way. I put a lot of time into the site and firmly believe that my IDP content is more in-depth, up-to-date, and accurate than the majority of websites/magazines that cover this specific part of Fantasy Football. I hope you find my site useful. If you have any suggestions for improvement, please feel free to send them to me and once again thanks for visiting.